This race in 2010 was my first marathon, and I still had enough mental scarring to be very wary. In fact I’d decided to give up all hopes of a pb (not very likely anyway) and attempt to help Martyn Dawson over the line in under 4 hours. He’s a better runner than me, and very mentally tough but he’d never done a sub 4 hour marathon. I know he can do it, and it seemed like a simple task to pace him to victory. This would also make sure that I wouldn’t blow up and could get the monkey off my back about this particular race. The weather was great, a little crisp but nice in the sun, and we started just behind the 4 hour pacers. We got in front of them and started hitting very consistent 5:20/km pace to give us a bit of time for drink stops etc (a 4 hour marathon is an average of 5:41/km) and things were flowing nicely until I heard Martyns ragged breathing over my shoulder. Normally it’s me who puffs like a train, but this was an early warning that I might not have everything go my way. Then the 4 hour group passed us again- I looked at my Garmin and they had sped up significantly, we were still on target so we let them go. As they went past I mentioned to Pat Farmer that they were going way too fast and he said he was going to swap places with the pacer in front and moderate the speed a bit. And yes I’m a name dropper, and no he has no idea who I am. By the way, he came across the line in 4:00:00 what an outstanding result for a pacer! The original plan was ‘take it easy until 25-30km, see how much we’ve got left and go from there’ which quickly turned into ‘hang on for as long as you can’. It turned out that Martyn’s massive effort at Trailwalker only a few weeks back had sapped too much out of his legs, and by the time we turned back towards the city, he was very unhappy. 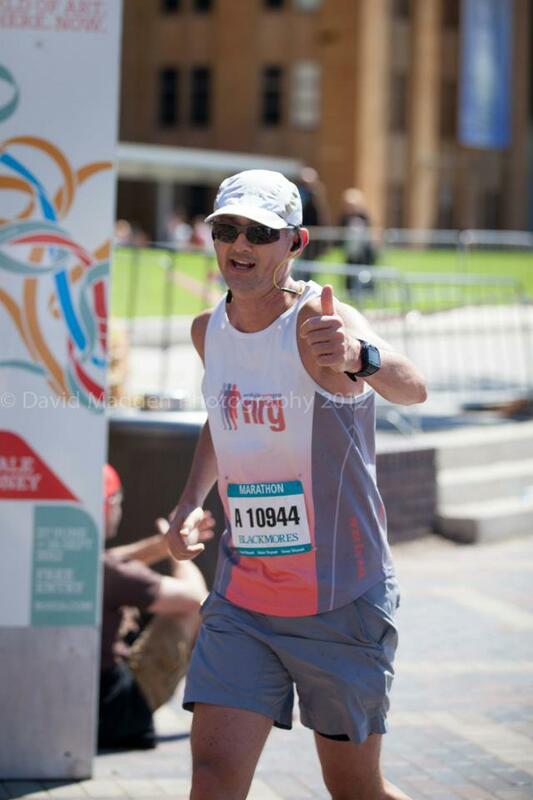 I searched my mind for any way I could help him but came up empty, so at about the 27km mark and about the 5th time he’d encouraged me to go on, I did. I’d failed in my primary goal, but I still had a good chance of my secondary, which was a sub 4 hour time for myself. Coming down Oxford St we saw Keith Hong waving a sign that said ‘HTFU’ er, thanks Keith! Through Hyde Park and the city and out towards Anzac Bridge I started to flag, but at the turnaround someone came up to me and started to chat ‘you look like you’re doing it easy’ ‘you look fresh and happy’ I pushed away the veil of pain and looked up to see one of the 4 hour pacers trying to engage me in a conversation. Normally that would make me very happy, but all I could think was ‘6500m, you only have to run another 6500m. It’s not that bad, it’s only 6400m from here’. So I did my best to try to be polite and then pushed on so I could save some energy for running. I saw Pete from the fast middies with about 4km to go looking a bit lost. He’s such a strong runner it seemed inconceivable that he might not make a sub 4 hour time. I think seeing a friendly face helped, and he came with me for a bit. Then with less than 2km to go Michelle Payne, who we’d been dicing with all day, came blazing past hoping to definitively crush me. It worked, she pushed me too close to the vom limit and I had to back off! The natural order of things prevailed and I finished in about the time and order I expected to. My final time of 3:55:09 was a solid result considering my mental problem with this course. Maybe next year I’ll race it properly. 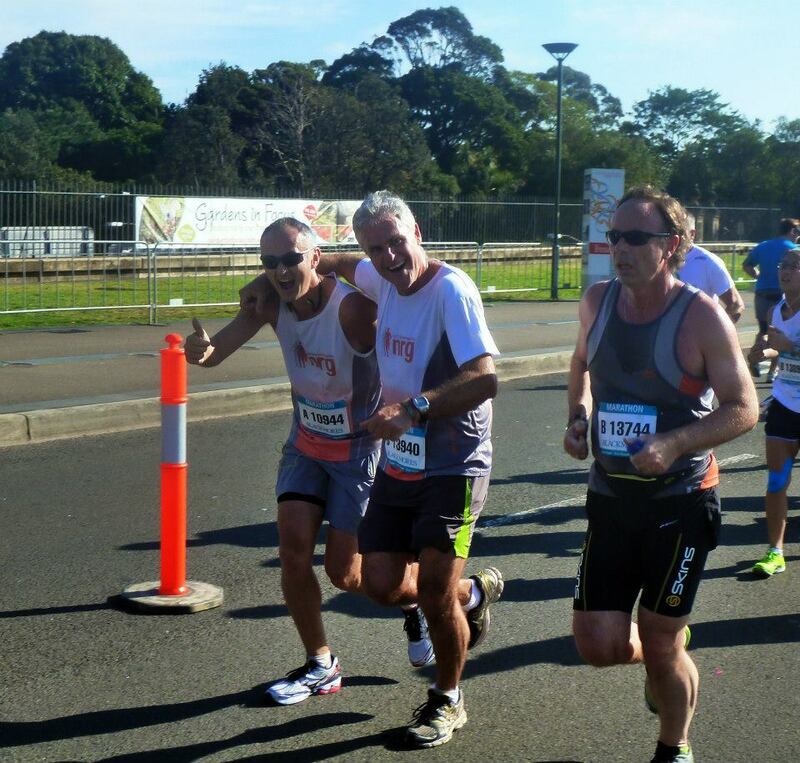 I could claim to have beaten Pat Farmer, Jane Trumper and Tony Abbott however the first 2 were pacers and the leader of the opposition was running with a blind man…….. so maybe not. Chris Dawe put in an amazing performance to score a 3:41 but I’ll have to have a little chat about negative splits- he was setting himself up for a 3:34 if you look at his first half. Steve pulled another brilliant effort out while coming back from injury, and Colette who now claims to be a bush specialist (ooh, er Vicar) got a PB. The way she convincingly trounces me in the bush runs I think she can expect many more PB’s in her future. It was truly beautiful to see so many friends lining the finish chute, sorry I couldn’t rustle up a smile. And a great party afterwards. Let’s just say that I would probably run 42km again just to share a few drinks with you crazy people!